When you have a tattoo and you want it gone, you need a solution you can count on. PicoSure laser tattoo removal treatments are the state of the art way to make your unwanted ink a thing of the past. 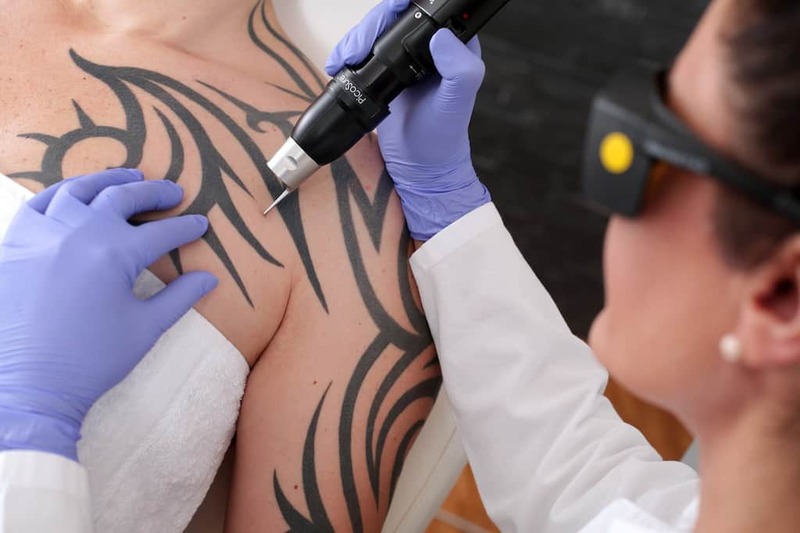 If you’re considering getting your tattoo removed with a professional laser tattoo removal technician but don’t know what’s in store for you, here’s everything you need to know about getting a tattoo removed with laser removal. The first step in getting rid of your unwanted tattoo is to speak with a professional about your options. A laser tattoo removal professional at Newport Tattoo Removal will assess your tattoo and go over your options with you. Although it’s difficult to provide an exact number of treatments which will be required, they will assess the size and colors of your tattoo and help you to get a better idea for what to expect. Consultations are always free. If a provider wants to charge you for a consultation, go elsewhere. You don’t want to be receiving your laser treatment on irritated or damaged skin. This means that in the days leading up to your session you should avoid anything which can lead to irritation. Avoid unnecessary extended sessions in the sun, like tanning, and use sunscreen if you will be spending time outside to avoid burns. Don’t shave the area around the tattoo unless instructed to, as it can lead to irritation. Tattoos persist because their particles are too big for your body’s natural responses to remove them. Each session of at Newport Tattoo Removal involves targeting the offending tattoo with a Picosure laser which breaks up the ink underneath your skin. This makes the particles small enough for your body to effectively flush them out. The result is a fading of your tattoo. With additional sessions, spaced four to six weeks apart minimum to allow for recovery time, you can further fade the tattoo until it is removed or light enough to be covered, should you prefer a cover up tattoo. Just as it is important to care for new ink, you should also be mindful of your skin following a removal treatment. Your removal professional will likely recommend keeping it covered for several days, and added attention to cleanliness after cover comes off. Be sure to follow these instructions closely to avoid infection and get the best results from your laser tattoo treatment. Getting a tattoo removed may feel like a daunting proposition, but with laser tattoo removal it doesn’t have to be the case. The technology for removing tattoos has never been better. If you’ve been considering removal treatments, contact a us today to schedule a free consultation at (949) 631-9009. Quit spending time with a tat you hate.